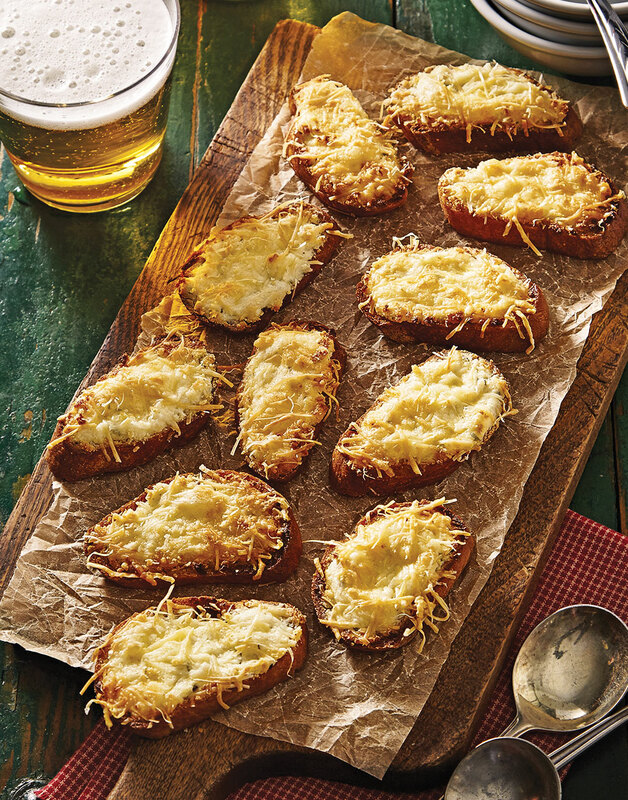 Crisp and cheesy, these Parmesan & Boursin Crostini make the perfect accompaniment to any soup or salad, but are out of this world floated on top of this Tomato-Cheddar Soup. Boursin is a soft, triple cream cheese strongly flavored with herbs and garlic. It was inspired by a dish in which fresh cheese was served with assorted herbs, so each person could blend their own. Alouette brand’s garlic and herb cheese is similar. Brush both sides of baguette slices with oil and season with salt and pepper; place on a baking sheet. Broil baguette slices until toasted, about 1 minute per side. Spread 1 tsp. Boursin on each crostini and top with 2 tsp. Parmesan. Broil crostini until cheese is bubbling and starting to brown, 1–2 minutes.